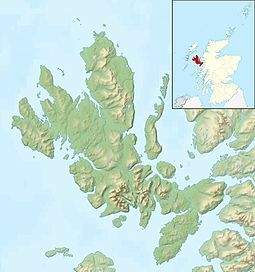 Eilean Bàn (Scottish Gaelic meaning White Island) is a six acre island off the coast of mainland Scotland, between Kyle of Lochalsh and the Isle of Skye, in Highland. The island supports part of the Skye Bridge, which crosses the mouth of Loch Alsh from the mainland to Skye. Eilean Bàn was home to John Lister-Kaye, who wrote his book The White Island about his time there, working for Gavin Maxwell. In 2001 the island had a population of two as recorded by the census but in 2011 there were no "usual residents" living there. Kyleakin Lighthouse is situated at the south-western end of Eilean Bàn. It was built by David and Thomas Stevenson in 1857, and is linked to a pair of keepers' houses. The lighthouse was automated and converted to use acetylene gas in 1960. Following the start of construction of the Skye Bridge, the lighthouse was decommissioned in 1993. It is a Category B listed building. ^ "The Eilean Bàn Trust". Retrieved 2008-04-13. ^ Lister-Kaye, John (1972). The White Island. Longman. ISBN 0-582-10903-5. ^ "Eilean Ban, Kyleakin Lighthouse". Listed Building Report. Historic Scotland. Retrieved 19 May 2012. Wikimedia Commons has media related to Eilean Bàn.